It’s no secret that successful organizations are constantly working to enhance employee engagement. When employees see themselves as an integral part of an organization, they naturally become brand ambassadors. Companies and corporations want consumers to see them through the eyes of these empowered employees. Creating enthusiastic employee engagement takes work, communication and a solid understanding of how your specific company can create authentic brand loyalty. Employers are now beginning to recognize that Generation Y (and soon Gen Z) are motivated much differently than their previous generations. So naturally, employers need to know how to create genuine and lasting engagement in evolving work culture of the modern world. Employee engagement is defined as “A human resource concept that describes the level of enthusiasm and dedication a worker feels toward his/her job. Engaged employees care about their work and about the performance of the company and feel that their efforts make a difference.” As a concept, employee engagement is simple and clear. But in practical application, successful firms, experienced HR practitioners, and business owners can attest that it creating real engagement becomes much more complicated. An actual process, employee engagement must find a way to be focused on the needs of the organization while still being employee-centric. So how do organizations enhance employee engagement? In his book ‘Drive: The surprising truth about what motivates us’, author Dan Pink suggests that to enhance employee engagement you can address three core intrinsic motivation factors: autonomy, mastery, and purpose. In the current corporate world, the best available tool for leaders and companies to address these motivations, solicit feedback and assess engagement are employee surveys. Often featured on evidence-based lists of high-performance HR practices, regular employee opinion surveys give employees the chance to feel heard and are great predictors of changing workforce behavior. 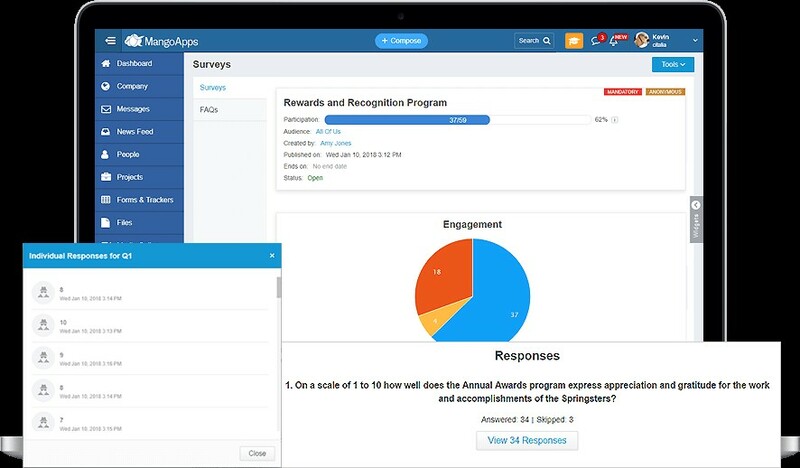 At MangoApps, we work with all of our customers to help them build an employee engagement platform using our survey tools and other modules. And with MangoApps already operating as your digital hub, it is much easier to implement an employee engagement process within the workforce at multiple levels. With MangoApps it’s simple to create and execute action plans for improving employee engagement, performance management, and even company culture. MangoApps also gives you the ability to customize your workplace processes based on your company’s size and requirements. 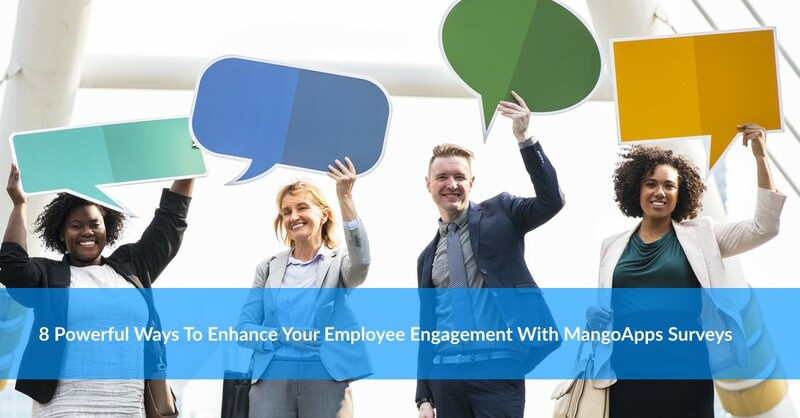 As an example of how we can help, let’s take a look at eight powerful ways you can enhance employee engagement using the MangoApps Survey Module. In order to separate employee engagement from other initiatives and avoid it from being an overused catchphrase with no end results, it is crucial to have a well-defined employee engagement program. According to psychologist Frederick Herzberg’s ‘Two Factor Theory’, employees are influenced by two factors, motivation, and hygiene. Motivational factors like growth or recognition give an employee drive and cause them to invest more of themselves in their work and strive to do better. Hygiene factors such as salaries, security and working conditions are the basic factors that influence job satisfaction. They determine a person’s happiness with their job and strongly influence employee retentions. However, it is important to note that adding more or better hygiene factors over a certain baseline will not increase job satisfaction or performance. These two types of factors are important to understand because they are the key to developing an effective engagement program. 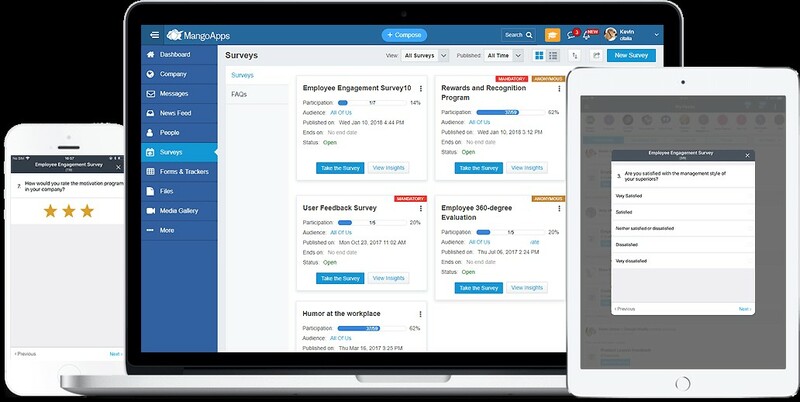 MangoApps survey module was built with these considerations in mind and works to help you to create an employee engagement program where employees can grow and thrive. With MangoApps, you can use easy to use built-in templates to get you started, format questions as multi-choice, opinion scale, star rating, text-based and more. You can even randomize questions to reduce answer bias as well as choose who the audience is for your survey. You can then implement the feedback from this employee engagement program with other MangoApps features such as Rewards and Recognitions, Levels and Badges etc. to boost employee morale. It’s true that HR plays a key role in raising levels of engagement among employees. This is also because most organizations still believe in the traditional ‘command and control’ management style and have restricted employee engagement to only as an HR department initiative. 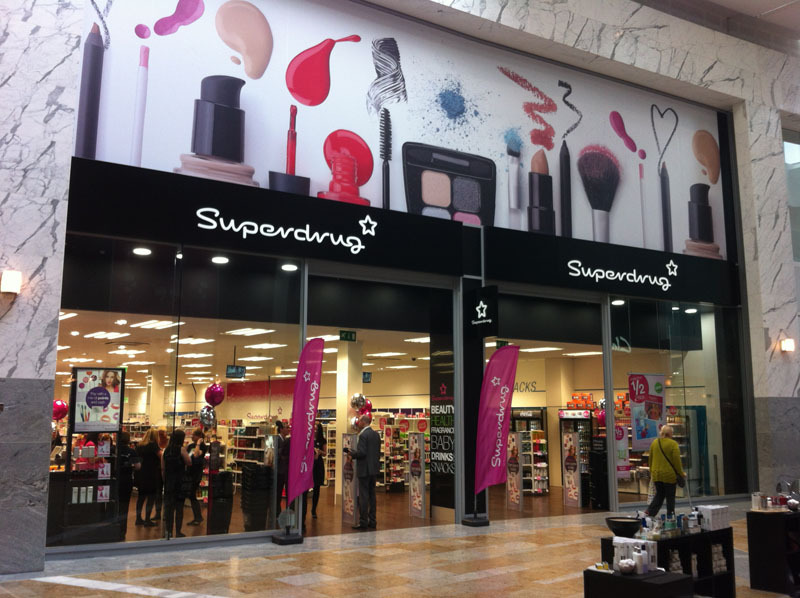 But employee engagement is much more effective when it is also driven through local departments and business units and not just as a big annual management driven event. Much like how different job descriptions have different core competencies, each of these departments and business units have different requirements, expectations, and feedback. Combining their feedback into a generalized HR driven survey completely dismisses the scope of improvement for these individual departments and business units. With MangoApps, you can create and conduct surveys for various departments and help your organization move towards a more consultative and participative approach. As a manager or a team lead, it is important to make sure new employees feel welcome, recognize, appreciated and most importantly, find opportunities to lean on employees’ strengths to help you as a manager. With MangoApps, managers and supervisors can create and conduct surveys for their employees designed to inspire a formal, meaningful conversation with them about what’s on their minds and how things can improve. This can be done on a regular basis or as often as you need to receive feedback and insight from your employees and colleagues. MangoApps helps you to build a better rapport between supervisors and employees, empowering you as a manager to open discussion lines and ensure employees receive autonomy. Most companies put a huge effort into design and campaign surveys to get feedback from employees. But a significant number of employees are hesitant of such surveys and don’t believe that their answers are truly confidential. This means that even with a genuine interest in employee feedback and a proper employee engagement program in place, you are unlikely to receive honest answers from your employees. Confidentiality and anonymity challenges often pave the way for mistrust within your workforce. In order to get the most honest and valuable answers, MangoApps has introduced Anonymous Surveys. With this feature, the anonymity of the respondent is honored and respondents are encouraged to participate honestly in the survey. Anonymous surveys let employees express how they feel about their work, team, and company. They are also a great tool on a secure platform for employees to share what is on their mind. Creating and conducting effective employee surveys is only part of the battle. The most important process is to uncover actionable insights and improvements by analyzing both quantitative and qualitative data. Within MangoApps, survey creators, assigned teams, and domain admins can view instant insights from conducted surveys. Participants can also view insights if they are designated as part of the intended audience. Survey insights can also be exported into XLS for further review and in-depth analysis. The levels and badges feature can help further enhance employee engagement as users receive points for creating or answering a survey. 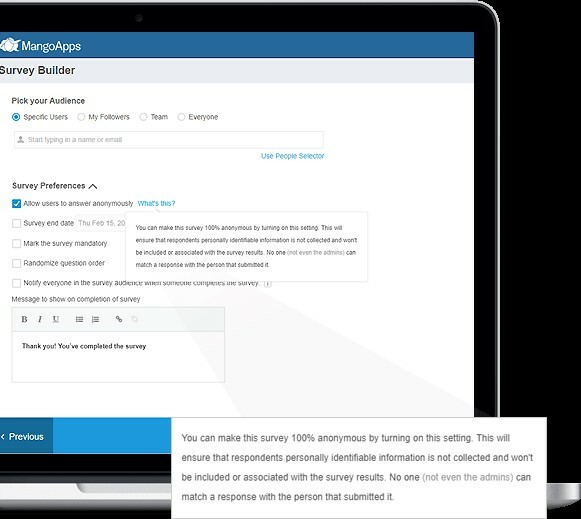 With the MangoApps survey feature, the online survey builder makes it easy for any user to create a custom survey. It also has multiple out-of-the-box templates to help you create exactly what you need. Creators can also easily preview their surveys and take a test survey to experience the flow themselves firsthand. In addition, you can set a deadline for the audience to take the survey to help encourage timely responses. The intended audience can take surveys any platforms – web, mobile or desktop, thus increasing the reach out your workforce. Once the feedback from your survey has been analyzed, the next important step is to craft an action plan that will address concerns and build a follow-up process. With MangoApps, this process can be created and assigned based on each individual role, making your goals tailored and specific. You can do so much more than just add more HR initiatives for the next year. MangoApps helps to assign tasks and actions to different individuals and ensures that valuable feedback collected from surveys is diligently implemented. Thanks to some major shifts in technology in recent years companies have expanded their business into new and still somewhat unexplored ways to work. Today’s workforce is far more mobile and more remote than any have been previously. Information is everywhere and often competes for more attention. The future of employee engagement depends heavily on a platform that is able to act as a single source of information for everyone, despite distractions and time zone differences. This platform must also be able to help the management to listen and act on feedback based on various engagement processes. MangoApps is the best future-ready platform available and ensures that employees have purpose and clarity, and that management can recognize contributions, built trust, drive change most importantly, enhance employee engagement.